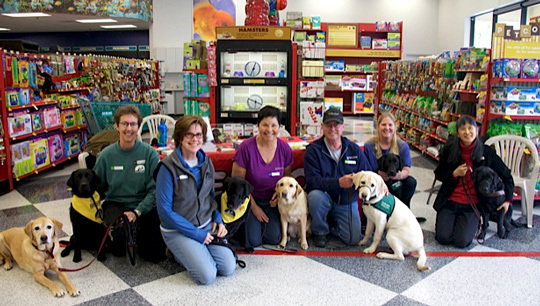 There were a lot of us at PetCo, Elk Grove, on Saturday, March 24, 2012, and all of them were in my new book, A Gift of Puppies. From Elk Grove, “Puppies with a Vision,” were Kathy Harwell and her daughter Jennifer (who got the family hooked when she was a little girl). 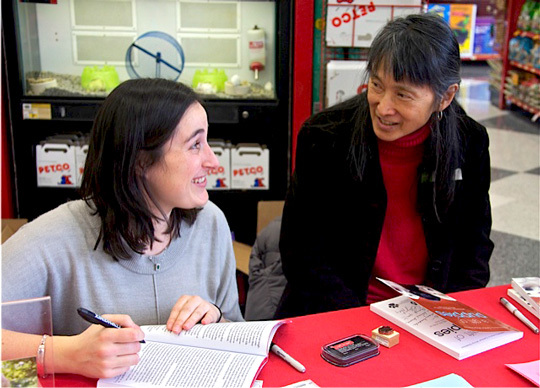 Kathy and her husband Greg have been leaders of the group for 12 years now. 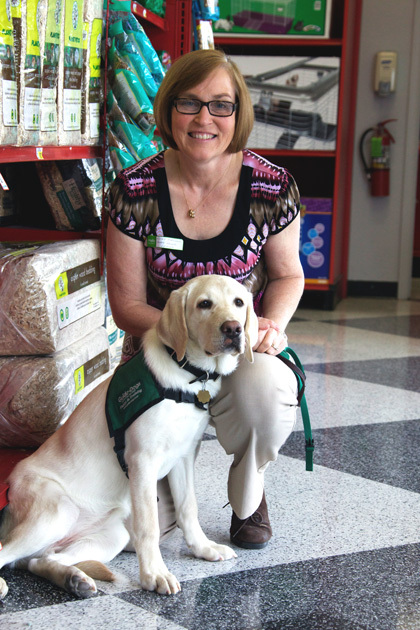 Their last puppy, Shubert, was recently career changed because he simply had too much energy to be a guide dog. His owner is thrilled. He’s a young guy with lots of energy to match. Linda Tinkham brought her new puppy, Evie, a cute black Lab who spent the entire time snoozing under the table. In fact, she was so quiet, that I forgot she was there. Steve Rawiszer, who shot so many of the adorable puppy pictures that were in the book, took pictures of each person with a pup — except Linda, because I forgot to tell him she’d brought one, and she didn’t say anything either. Linda and her husband John raised Sweetie, who just graduated with a partner last month. Barbara and Jerry Edwards brought Ariel, a yellow Lab puppy they’re co-raising with Linda’s daughter, Ali (who is another former child puppy raiser who is responsible for getting her parents into that time-consuming, yet rewarding volunteer work). 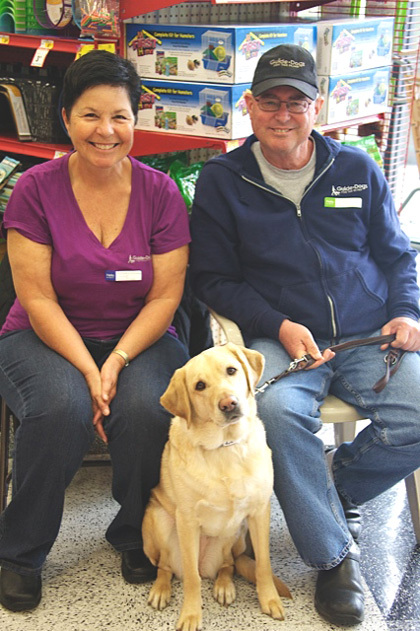 They also brought Doris, a retired guide that had been partnered with Rebecca, the blind handler who contributed the “you people” story to the book. When Doris retired, Barbara and Jerry received her back into their home. It’s one of the blessings of being a puppy raiser. 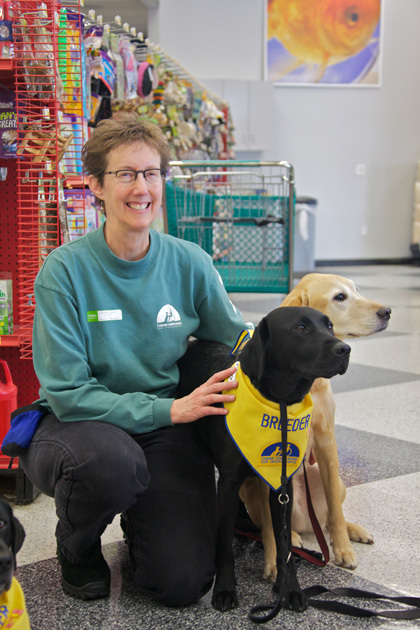 Barbara and Jerry were stationed nearest the big sliding glass doors, so the first thing people saw as they entered the store that day were two lovely yellow Labs, one in a green puppy in training coat, and one quite pet-able because she is no longer a working dog. Hedy and I were at the left end of the table next to the Edwards, so people could see what a dog in harness looks like. We also did demonstrations. Most people have never seen a working dog doing its job. It’s an inspiring sight. 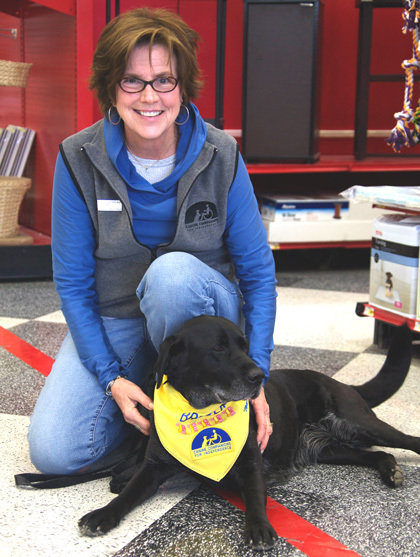 At the other end of the table sat Kathy Ulm, the first CCI puppy raiser I had ever met. She is from the Gold Rush Champion puppy club. She brought Flurry, who was a puppy in training when I interviewed her and Gloria Merk eons ago. Now Flurry is a breeder and has already had her first litter. Kathy also brought Ethan, a retired Full Service Dog. They are the top of the line. They can understand more than 45 commands. Ethan did demonstrations that wowed the onlookers — picking dropped keys off the floor or, even more impressive, a penny. Then he’d put his forepaws on Kathy’s lap and drop the item there. I could see how much he enjoyed doing his work. He had a twinkle in his intelligent brown eyes. Toddy, another gorgeous black Lab, is a breeder for CCI. She lives with Pam Flanagan and her husband Steve Rawiszer and does agility when she’s not having pups. Pam’s breeders have had 30 litters and she has helped more than 300 puppies into the world. 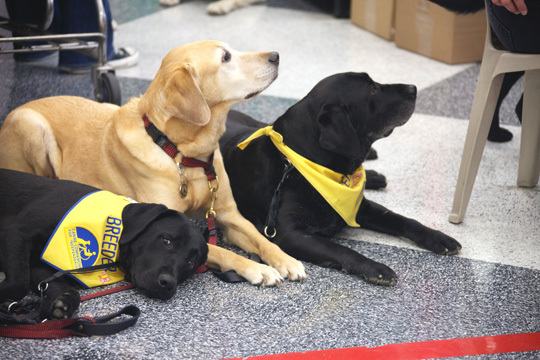 Toddy and Flurry looked stunning — sleek black Labs in bright yellow scarves. Because Ethan is retired, and Toddy and Flurry are breeders, they, too, were pet-able. Customers who got to pet Doris, were taught to ignore Hedy (who was looking official in her harness even though she was napping), were encouraged to pick up information on CCI and GDB dogs and puppy raising, and then finished with a chance to pet another three beautiful, well-mannered dogs. It was a big hit with the children. But the greatest treat for me was a big surprise. My O & M (Orientation & Mobility Specialist), Scott Kies, and his wife Alicia, came all the way from the gold country to see Hedy and me. They had come to our graduation in December, 2008. I had a few more sessions with Scott after that, and then he said he was cutting me loose. I was successfully independent and needed him no more. I hadn’t seen either of them since. When I got ready to apply to GDB for my dog, I worried that the school would think I didn’t really need one. Scott had been to the school for special training with guide dog teams. He understood GDB’s requirements. He had a client who had recently been turned down. So I asked if he thought I would qualify. He looked thoughtful, rubbed his chin, and pondered my question for a very long time. Then he said, “I can see you sitting there with a great dog by your side.” He was right. And when he surprised me at PetCo that day, there she was, my great dog, right by my side — snoozing peacefully on her mat. 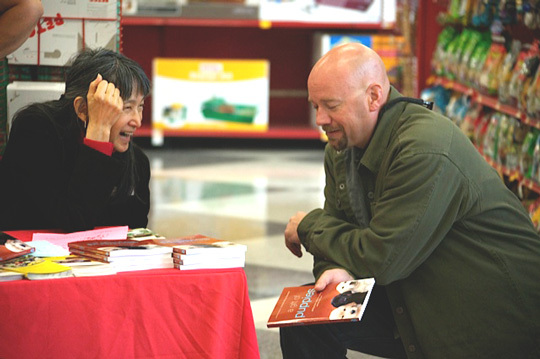 Thanks to General Manager Aaron Elkins at PetCo, Elk Grove, CA, for hosting us in our book signing and community awareness event. The staff there is always gracious to us, and I love those bright red tablecloths that make it look so festive. We appreciate your hospitality. What a wonderful blog on all the puppies. Love the pictures, but the story is so interesting. Thank you for the headsup on this event. Every human face you saw on that blog has given up more than one wonderful pup. Can you imagine spending 5 hours with people who have those gigantic, loving hearts? It was a treat! Glad you stopped by and made their acquaintance!